Cutting Teeth takes place one late-summer weekend as a group of thirty-something couples gather at a shabby beach house on Long Island, their young children in tow. This has got to be one of the best and most honest novels about parenthood that I have ever read and I have definitely read my fair share of those! Cutting Teeth was so brutally honest at times that I found myself nodding or cringing in recognition of the scene or thoughts of the character. I really liked how the author changed the point of view and character in every chapter. It gave unique and interesting perspectives on a common situation (which was a weekend away for a playgroup). It was quite interesting to see how many sides of a story there could be and how people's lives may be similar but so very different at the same time. This book had so many complex emotions and situations but also dealt with personal issues, couple issues and child issues in a very real way that I have not found before in a novel. The children's actions were very age appropriate and even their dialogue seemed realistic, which I find very rare when people write children into a story, so this was definitely a big plus for me. 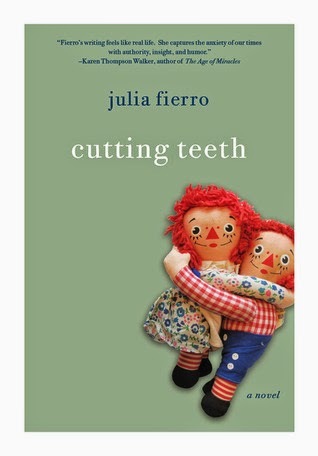 Cutting Teeth far exceeded all of the expectations I had for it and I can see why it is a highly anticipated debut as I could not put it down and actually opted to not sleep to finish it. I cannot wait for this author's next work!